“Escher Chronicles” is a series of compositions inspired by Dutch artist M.C. Escher’s prints, engravings, and woodcuts. 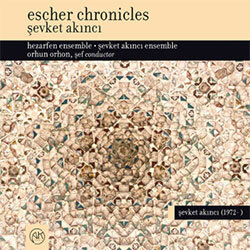 I have had the privilege to record with one of Turkey’s best contemporary chamber orchestras, Hezarfen Ensemble. The work contemplates such concepts as depth, relativity, metamorphosis. As you may guess, in Turkey or elsewhere very little budget – or most of the times none at all is reserved for classical music of experimental/contemporary nature. “Escher Chronicles” is one of them. Since a higher number of musicians, a higher number of recording, mixing and mastering hours was needed to complete a work of this nature. Now the album has finally surfaced, and you can buy it from D&R shops or A.K. Music.